Children who are given plenty of unstructured time outdoors learn how to appreciate nature and draw inspiration from the sights, sounds and smells that they experience as they explore and roam. Even if you live in the city, you can still find many opportunities for your child to enjoy nature. Look for playgrounds surrounded by trees and fields. Go for walks, even a city sidewalk is home to all manner of plants and animals – take it at your child’s pace and you might be amazed at all the wonders that they find. Climbing, running, skipping, jumping…the outdoors gives children plenty of space to move their muscles and fully develop their mind’s potential. The mind can not fully develop without these kinds of physical activities that stimulate the brain’s development. Television, computers and video games aren’t all bad, however, they are also not necessary for a child to grown and can crowd out more developmentally appropriate activities. Electronic toys can also have a place, but are inferior to toys that are powered by a child’s movements and imagination. Your child will have plenty of time for electronics during their teen and adult years, so don’t feel like they are missing out if you limit them now. Old fashioned toys like blocks, puzzles, wooden vehicles, puppets, dolls and dollhouses fully engage your child’s imagination. They can also help increase your child’s attention span naturally, as your child expands upon their games and makes them more complex and intricate. Children who play pretend and other imaginative games engage in an internal narrative that will help them self-regulate as well as increase their creativity. When choosing toys for your child, look for ones that rely on your child to supply the storyline and action. The best toys can be used in many different ways and help your child develop a wide range of fine and gross motor skills. You can also supplement toys with household objects, such as an old blanket that can be turned into a cape or swaddle a doll or a picnic blanket. Designate an area of your house as an arts and crafts zone. Don’t worry, you don’t need an extra room for this, even the dining room table or a corner of the kitchen will do. The idea is to make sure your child feels encouraged to create art instead of looking at it as a hassle or nuisance for you. You don’t have to spend a lot of money on art supplies. An easel is nice, but if you don’t have room, there are tabletop versions that work just fine. Paper, crayons, paint, scissors and glue are the basics that you’ll always want to have on hand. Special supplies like glitter, fancy paints and stamps are nice to have and make great gifts. Combine commercial art supplies with found objects such as scraps of wrapping paper, bits of fabric and buttons and other sewing notions. 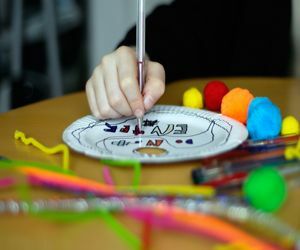 Visit your public library or look online for ideas for crafts that are appropriate for your child. Don’t worry about being perfect; instead keep the focus on trying new things and experimenting with new ways to use express yourselves. Do encourage your child to do their best and concentrate without nitpicking or jumping in to do it for them. Your child’s creativity will blossom if you give them the nurture they need for proper brain development, plenty of inspiration and a wide variety of experiences to feed their imagination. Freedom to play, explore and create are the building blocks for happy, intelligent and imaginative adults.